By far the most cost efficient material, standard paper signs are used to convey a quick message indoors. Promoting your business at a local small vendors event held indoors? A Standard paper sign may be best for you. They are water resistant, and the text and images on them will not run. The only disadvantage when investing in this sign is that it will get soggy. Promote yourself from behind closed doors with this material! Glossy paper is water resistant as well. Very similar to photographic paper, it is the same sturdiness as standard paper with a shining finish. Ideal for photos or posters that hang indoors, give your customers a visual of the product you have to offer by using glossy paper. Selling handmade jewelry? People will have to approach your stand first before feasting their eyes on the gemstones, and intricate wiring your expert hands created. Attract their attention by hanging large photographic signs of your best work! Used for outdoor events such as farmer’s markets, political rallies, festivals, and fairs banner vinyl is printed with UV and water resistant inks. 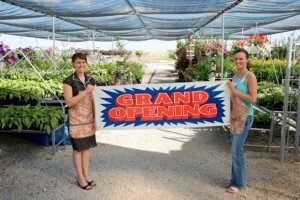 Lasting up to three years, this investment is best for seasonal events that require signs. Does your neighborhood hold annual festivities in the summer? Print out an outdoor banner vinyl sign if you plan on marching in the parade! Want to sell your art at the Maryland state fair this year? Using this sign will keep you coming back each year. Force yourself to stay on top of your work and sales! Buy a banner vinyl sign today! Perfect for graphics that are installed on the inside of windows, window static cling has a opaque, white background while the detailing of the sign’s message encompasses the front. They are easy to install, requiring a simple spray bottle and water, mild dish detergent mixture, and a window squeegee. Do you own a large commercial space with many windows? Posting signs that take advantage of your facilities floor plan is economically responsible. Another sign for outdoor use, exterior window stickers are printed on UV and water resistant paper as well. Especially designed for outdoor use on printed windows, these stickers work best when you have a commercial space with an overwhelming amount of windows. With bubble free application, install this on the exterior of your business for a smooth finish and a clear message. Perfect for spicing up those plain, white wall spaces you’ve been meaning to decorate, wall stickers are useful for indoor purposes. Easy to apply and remove without making a sticky mess, these signs can be applied and removed more than once in multiple places. Want to spread the word about that unforgettable sale you’re having next week? Wall stickers can be easily displayed, and are relatively low cost. Planning On Selling Personal Retail This Summer in Baltimore? Use a Printed Sign to Promote Yourself! Time Printers is a full-service printing products and services business located in Baltimore, Maryland. Our graphics team of experienced professionals can help you bring your vision to life in a timely and affordable manner. Our unique portfolio speaks for us and our quality services. To learn more about vinyl banners for spring events, please give Time Printers a call at 410.566.3005. At Time Printers, we believe it is our job to make you look good! Quality products can help your business make a lasting impression on your customers and clients. You can also follow us on Facebook, Twitter, Google+, Pinterest, and LinkedIn for weekly tips, information, and news on printing! This entry was posted on Tuesday, June 7th, 2016 at 8:00 pm	and is filed under Event Materials in Baltimore, Printing Advertisement in Baltimore, Professional Printing in Baltimore. You can follow any responses to this entry through the RSS 2.0 feed. Both comments and pings are currently closed.